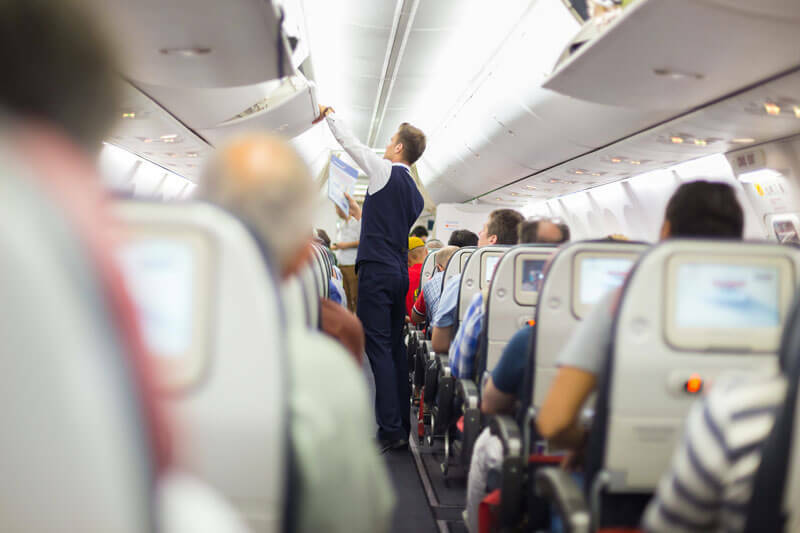 If you’ve suffered any type of injury while on an airplane and you believe the airline or its employees are at fault, an experienced attorney at Cellino & Barnes can help. A number of in-flight injuries are caused by luggage falling out of overhead bins. According to some estimates, more than 4,000 people are injured every year from falling suitcases, bags, boxes, and other carry-on items. Under certain circumstances, injuries resulting from falling luggage can be severe. Passengers can get struck on the head by luggage weighing over 50 pounds. Even if a victim is not hit on the head, these heavy carry-on bags can cause major damage to hands, feet, arms, and legs. It is the duty of flight attendants to be certain that all carry-on bags are properly secured before take-off so these injuries are prevented. Anyone who has left their hand in the aisle on an airplane knows a serving cart can be an unexpected and unpleasant guest. In some cases, unsecured serving carts have been documented to roll down an aisle and injure a passenger. In other cases, these heavy beverage carts have pinched passengers arms and legs which caused serious cuts and other injuries. These beverage carts also carry extremely hot liquids. For example, coffee can reach temperatures of over 180-degrees (Fahrenheit) – close to boiling. Liquids at this temperature can produce third-degree burns in just seconds. In any of these cases, a victim may be able to recover compensation for medical bills, lost wages, or pain and suffering. Loose carpeting or debris on an airplane aisle can be hazardous as well. A trip and fall might result in a sprained or broken wrist. On an airplane, these incidents can be more dangerous due to the small aisles and sudden aircraft movements. An airline is also responsible for maintaining the jetbridge, or the tunnel connecting the airport to the airplane. If these areas are not properly maintained and cleared of debris, it can create a hazardous situation for passengers. To determine whether or not you have a claim, it is important to discuss the incident and resulting injuries with a qualified attorney who understands airplane injuries. Over 40,000 in-flight medical emergencies happen around the globe each year. At that rate, it’s no surprise that airlines train to respond to this situation but sometimes, negligent flight crews fail to act correctly in a medical emergency. On an airplane, passengers are inside a pressurized metal tube traveling at 600 miles per hour at 30,000 feet above the ground – and it could take up to 30 minutes for a pilot to land. This is why flight attendants are required by law to deliver basic first aid as well as begin the process of getting help. If the flight crew fails to take the appropriate measures and precautions, it could put a passenger’s life at risk. In-flight turbulence is the leading cause of injury among airplane passengers and flight attendants. According to the Federal Aviation Administration, turbulence has resulted in hundreds of injuries in just the last two years – and safety experts consider the federal statistics a conservative estimate. In 1998, The Flight Safety Foundation studied turbulence in detail and discovered that injuries directly related to turbulence occurred at astounding rates; and many of the injuries were not recorded as turbulence accidents. According to their research, an estimated 4,500 passengers are injured every year among the 14 largest carriers. Turbulence injury lawyers say many of these injuries are due to falling baggage from overhead bins or items being thrown throughout the passenger cabin. Airplane injury attorneys said the accidents could be happening more frequently today. Since the Flight Safety Foundation study in 1998, airlines have implemented pricey baggage fees and flights are more crowded than ever. As a result, a turbulence injury lawyer at Cellino & Barnes says passengers are loading more items into carry-on bags and jamming them into overhead bins. If you’ve been injured by turbulence or falling items while on an airline, you may be entitled to significant compensation. Contact an airplane injury attorney at Cellino & Barnes today for a free consultation. Not all injuries occurring in the air or on the tarmac are the result of negligent airline workers. Sometimes the aircraft itself, or its equipment, is defective and can malfunction. If an overhead bin fails to latch, for example, luggage can unintentionally fall mid-flight. Airlines have a responsibility to inspect and repair overhead bins, among other pieces of equipment on a commercial aircraft. If crews neglect to make the flight safe, an injured passenger may have a claim against the airline. A 737 passenger jet is made of 367,000 parts and each one must be operating correctly. If you’ve been injured due to a malfunctioning or defective airline part, contact an attorney who can help determine the appropriate course of action for you and your family. Every case is unique and an experienced attorney can determine the correct actions for you and your family to take if you’ve been injured on an airplane.